Final Cut Pro X provides revolutionary video editing features along with an incredible level of organizational features. The entire workflow is very Apple: simple, intuitive, and powerful. Apple Motion: This helps expand the capabilities of FCP X to allow for sophisticated compositing, transitions and visual effects. Compressor: This allows Final Cut Pro to convert finished videos to formats suitable for distribution. GeniusDV only uses ‘contract’ trainers who work for us part-time. This means you get Emmy Award caliber instructors who happen to have a passion for teaching. I just returned from a week-long training class in Florida and I wanted to say ‘thank you” once again for what I felt was probably the most beneficial and thorough training I have ever received in my 30+ year career in Video Production….John and Juan are amazing instructors and great guys…my brain hurt after a week long class in Final Cut Pro/Motion X and I was amazed at how much I thought I knew and how much I learned….a well organized and well delivered class…the small class size was focused and intense…..loved every minute of it all……well done guys!!! !….thanks…MG (Dept. of Defense Video Editor). 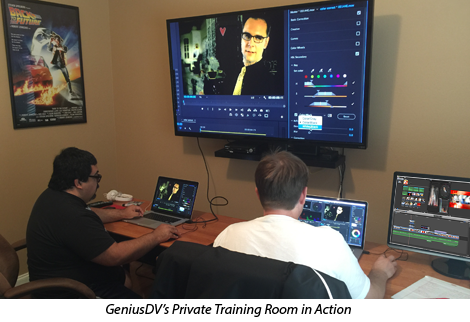 My co-worker, Mr. Mark Grove and myself went to Genius DV in early August 2017 for Apple Final Cut Pro X (FCPX) and Motion training. I have about 27 years of Video Production experience with my most recent involving 12+ years of working with Premiere Pro prior to this. The training I received from our chief Instructor (Juan) was excellent. From having a minimal self-taught experience with Final Cut Pro, in no time at all Juan had us understanding the capabilities of FCPX. My proficiency and speed of editing doubled in the course of three days. When I had troubles with an effect or animation, Juan had no trouble with assisting me to get back on track. If you are looking for a solid 5 day course to get comfortable with Final Cut Pro and Motion, look no further! Our Final Cut Pro X class teaches an integrated workflow using FCP 10.X with Apple Motion 5.X, and Compressor 4.X, and Apple has designed FCP X to seamlessly work these programs. Therefore, it’s an absolute must that you learn the basics of Motion and Compressor. Interface Overview: Learn the Final Cut Pro X interface from the broad overview level down to those obscure by useful controls that are hiding in plain sight. Importing video into FCP X: Bring video into Final Cut Pro from a variety of sources. This includes media from a camera, tape, media cards, or archive sources. Media Management: Understanding the relationship between files at the disk level vs what you see in the FCP X interface. Organizing: Take what you’ve imported, apply keywords and use those keywords to find what you need. 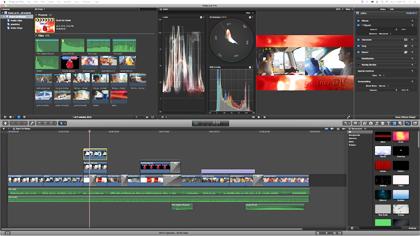 Editing: Learn how to build and refine a project using the editing features of Final Cut Pro X. Using Effects: Learn how to use presets such as blurs, glows and lens flares. Then learn how to make adjustments to the effect presets. Animation: Creating keyframes and controlling attributes over time. Color Correction: Fix lighting problems, compare shots to make them look the same, and changing color characteristics to create a specific mood. Titling: Learn how to use titles and lower thirds to enhance your project. Motion, a product in Apple’s Final Cut Pro family, allows you to create stunning motion graphics and visual effects with unprecedented ease. 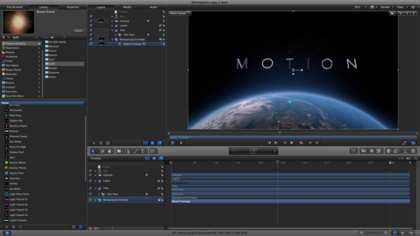 In fact, every transition, generator, and title in Final Cut Pro X was created in Motion. Although Motion is easy to use, it serves many different purposes, so it is fairly complex. This class will ground you in the fundamentals so you can harness the speed and powerful features of Motion. Industry professionals are using Motion to add complex effects to their productions. Complex motion graphics are no longer limited to high end post production houses. Anyone who has Motion in combination with Final Cut Pro is now able to produce stunning motion graphics and animations within their projects. With the release of Final Cut Pro X, Apple has upgraded Motion to version 5. While the new version is dramatically different behind the scenes, its core feature set has not changed substantially; instead, Motion 5 adds deep new integration with Final Cut Pro. In the new version, you can use Motion to create or edit literally every type of visual element in FCPX–generators, effects, transitions, titles, and full-fledged templates. Editing Final Cut Pro filters in Motion: Learn how to customize the pre-built filters within FCP X. Editing FCP X transitions: Every built in transition within Final Cut Pro X is a Motion project. Learn how to use Motion to tweak the built-in transitions within Final Cut Pro X. Creating Generators: Learn how to create new video elements from scratch according to parameters that you set in Final Cut Pro X. Learn how to create visual patterns like flames, explosions, particle system, and visual elements such as muzzle flashes all within the FCP X timeline. Text Effects and Behaviors: Learn how to crate and build a kinetic text effect. You will also learn how to edit text on a motion path. We will teach you how to track and animate your text elements. Rigs: Learn how to connect multiple control parameters to a master control, which which allows multiple parameters to be controlled universally by a master control. Advanced Keying: Learn how the advanced keying controls work within Motion 5.0.